Background: Neurodegenerative disorders are among the most common challenging diseases that affect the population with extreme medical and financial burdens. Widely seen neurodegeneration affects population of all ages, as it progresses with age, affecting a large proportion of elderly population including patients, caregivers, and immensely increasing the financial load of the country. These diseases have a very complex nature that frequently results from combined genetic, environmental and pathological factors. Various challenges are faced by the researchers working on the pathogenesis and the possible treatment of neurodegenerative disorder. 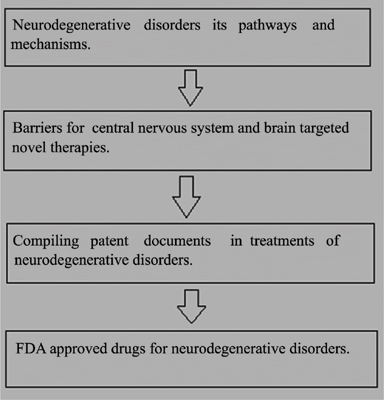 Objective: The review has analysed for recent patent documents and treatment approaches for neurodegenerative disorders. This review does not relate to potential targets such as ( i.e. protein where modulation could be predicted to impact on pathophysiology), rather it mainly focuses on various available patented approaches for neurodegenerative disorders. Method: The study design is based on updating the international and national literatures and an exhaustive patent search, compiling various patented documents for the treatment of neurodegenerative disorders (EP2282779A1, US20110229555A1) to provide information in the state of technological innovation in terms of research and development. Results: In the present review, the authors described various neurodegenerative diseases, there treatment strategies and emphasized on various patented approaches for age-related neurodegenerative disorders such as novel therapeutic methods for treating Alzheimer's and associated disorders via modulated cell stress response EP2282779A1, through combined therapies that modulate angiogenesis US20120058992A1. Conclusion: The review will attract the interest of academics, researchers, students and pharmaceutical companies with regard to the recent on-going activities in neurodegenerative disorders. Keywords: Neurodegenerative disorders, Alzheimer's disease, Parkinson's disease, Huntington's disease, CNS barriers, patents. Keywords:Neurodegenerative disorders, Alzheimer's disease, Parkinson's disease, Huntington's disease, CNS barriers, patents. Abstract:Background: Neurodegenerative disorders are among the most common challenging diseases that affect the population with extreme medical and financial burdens. Widely seen neurodegeneration affects population of all ages, as it progresses with age, affecting a large proportion of elderly population including patients, caregivers, and immensely increasing the financial load of the country. These diseases have a very complex nature that frequently results from combined genetic, environmental and pathological factors. Various challenges are faced by the researchers working on the pathogenesis and the possible treatment of neurodegenerative disorder.